Impressive presentations on the New Children’s Hospital were made at the May event of the CitA Smarter Cooperative Building Series. The Smarter Cooperative Building Series presented the New Children’s Hospital, one of the main Irish BIM case studies, at the Royal College of Physicians on Dublin’s Kildare Street. 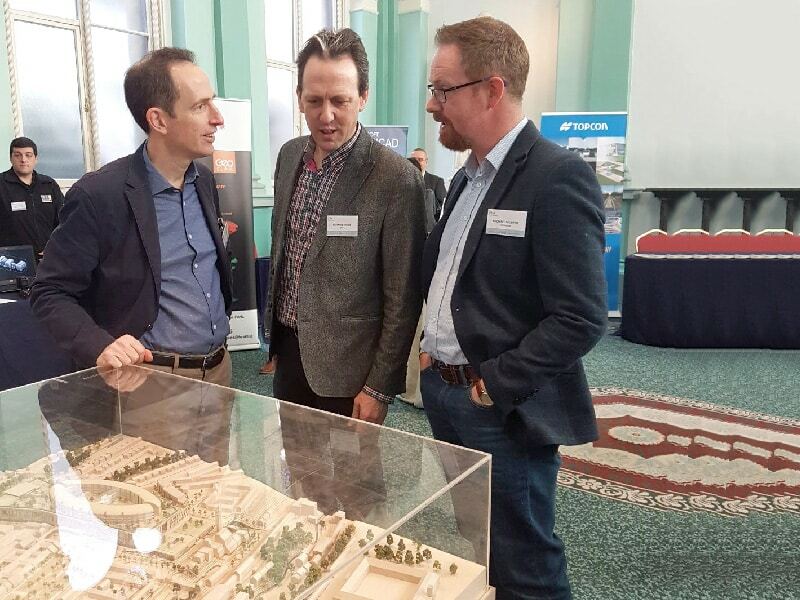 CitA’s work with the Construction Industry Council (CIC) members is helping digitise the Irish Construction Industry, and from this meeting – the third of six events for 2017, we got to see a landmark BIM project in detail. The May breakfast meeting of the CitA Smarter Cooperative Building Series was titled ‘Creating the Smart Hospital of the Future: an integrated presentation from the delivery group of the New Children’s Hospital’. The meeting co-hosted by the Society of Chartered Surveyors Ireland, at the Royal College of Physicians, had a large attendance of approximately 160 delegates; while the event was also available to watch online. The presentations were well received by the attendees and the interactive Q&A session which followed included diverse questions relating to the complex project. From our BIM People interview with Professor Rafael Sacks for BIMIreland.ie we know that the third edition of The BIM Handbook, a popular book, will have the New Children’s Hospital as a case study, and Dr Alan Hore referred to this. In his interview, Rafael talked about the Aviva Stadium and New Children’s Hospital projects as case studies and said, “With regards BIM, this is amazing considering Ireland is a small country.” From attending the CitA events held in the past year the impressive work of Ireland’s BIM Community is obvious. The workshop which took place after asked attendees questions on Leadership in BIM adoption in the Public Sector. The attendees also got to hear about the progress of the BICP Study. The New Children’s Hospital (NCH) is the largest, most complex and significant healthcare project ever undertaken in Ireland. The site is located at the St James’s Campus. NCH will bring together into one entity three existing hospitals: Our Lady’s Children’s Hospital Crumlin, Temple Street Children’s University Hospital, and the National Hospital in Tallaght. The initial cost estimate was approximately €650m, excluding fit out costs. The development is expected to be completed by 2019, and to become operational by 2020. Works began on the first phase in July 2016. The presentations were from the NCH project team, Dr Barry McAuley of CitA and Dr Alan Hore of CitA/Dublin Institute of Technology. The NCH presenters were Tom Costello, IPUT/ National Paediatric Hospital Development Board; Phelim Devine, New Paediatric Hospital Development Board; Seán O’Dwyer, BDP; Patrick Pease, ARUP; Simon Dunne, O’Connor Sutton Cronin; and Gary Comerford, Linesight. Tom Costello gave the opening address welcoming attendees. Tom is Chairman of the National Paediatric Hospital Development Board and Head of Construction at IPUT. He spoke of what this hospital will offer the children of Ireland and the vision for the development and the area. He went through the project programme outlining the planning, design, procurement, and the start of construction. He said that a world-class children’s hospital is a challenge not just for the team but for BIM. A platform for coordinated and collaborated design is what is expected from BIM he said. The project has embraced Lean Construction and off-site construction will lead to savings and less time on site. BIM will be used throughout the project lifecycle. In his address, Tom highlighted worrying issues for the industry: Only 2% of school leavers chose apprenticeships last year, and regarding construction costs, Dublin is in the world’s top ten most expensive cities – Tom saying we must become more competitive. Concluding, he praised the work of the NCH team. Phelim Devine was the next speaker. Phelim is Design Director and Deputy Project Director on the National Paediatric Hospital Development Board. His presentation was titled ‘Project Vision and Client’s Requirements’. He presented images of the 50-acre campus and design elevations to show the project’s scale. He said setting the right client, procurement, and construction teams were critical. The public works contracts were not suited for this project, so a bespoke contract was used. He went into some detail on using BIM in construction procurement. Medical professionals benefited from being shown 3D models instead of 2D drawings. The team used VR to show future hospital staff rooms and facilities. He spoke of future challenges and talked about how BIM would be useful through the lifecycle of the project. Seán O’Dwyer, Associate and BIM Manager at BDP, gave a presentation titled ‘The New Children’s Hospital – A BIM Environment ’. He spoke of how information is accessed and the use of Revit models. In his presentation, he showed the complexity of the project’s design. Coordination will be a major project objective, and he described the fascinating Level of Detail (LOD) of the project. Attendees were interested to hear about Google GoPro VR and what it is like to view the model, and after viewed it themselves. Patrick Pease, Mechanical Engineer at Arup, gave a very technical presentation titled ‘Data flow for the HVAC design of the New Children’s Hospital’. Patrick discussed Arup’s approach and how information was generated and the HVAC was designed and the software used. Good ventilation will be critical for this project. Dr Alan Hore praised this presentation saying as a Quantity Surveyor he had learned a lot about mechanical installation. Simon Dunne, Associate at O’Connor Sutton Cronin, was next up with a presentation titled ‘Integration of BIM into Civil and Structural design’. He said BIM is important to his Company; they have been delivering BIM projects since 2005. He described the survey and investigations which were undertaken in 2014, saying the services and design were complex – showing the P2 core, lecture theatre, and helipad as examples. Gary Comerford, Associate Director at Linesight, gave his presentation titled ‘Procurement Challenges in a Digital Environment and SCSI BIM Working Group Update.’ He talked about working within EU procurement rules and the public works contracts. He discussed the procurement strategy for the project, and the opportunities and challenges presented by BIM. Aligning information in the model with the Agreed Rules of Measurement is now a challenge. Now heading into the second stage of the tender process, he explained the process and how works will be measured. Speaking on the SCSI BIM Working Group Update, he said more surveyors are now engaging with BIM. All the presentations finished to applause. Questions and answers followed. This segment of the meetings provides the attendees with an opportunity to question construction industry experts working with BIM. There were technical questions regarding the software used on the project, as well as questions about the use of off-site construction practices, how the handover of the project will be undertaken and the use of COBie. The issue of the project requiring four more years to complete and the evolution of the software over time was brought up. Many questions focused on the facilities management of the development, engagement with facilities managers and data flexibility. The advantages of having defined requirements and informed clients were also discussed. The Roundtable Workshop segment involved the CitA Team asking attendees for feedback on Leadership. The questions asked were: How can the Irish Government do more to increase BIM take up in the future in Ireland? Do you think that the Government, as a client, understand BIM and that they are ready to show by example the benefits of using BIM to local authorities and the private sector? There were a number of suggestions from attendees, including the suggestion for pilot projects and comparing these with traditionally procured projects. It was also suggested that BIM training programmes and centres of excellence were examples of how the Government could intervene to promote BIM. Dr Barry McAuley, BICP Researcher, gave an update on the progress with the BICP Study and said that globally Ireland is doing very well in BIM education and training, but with regards BIM policy we have a lot of work to do. He said he welcomed feedback from the BIM Community on the BICP and would like to hear from the industry about any new BIM projects which could become potential case studies. Concluding he said the upcoming BICP report “is a must read” and the most comprehensive study on BIM in Ireland. He stressed the workload that was involved in undertaking the Study which involved the private sector, public sector and third-level colleges. In his closing address, Dr Alan Hore thanked the Society of Chartered Surveyors Ireland for co-hosting the event. Stating this was the biggest attendance at a CitA breakfast meeting to date, Alan thanked the speakers and attendees. The Construction Industry Federation will co-host the next event in the Series, taking place on 21 June. On 22 June, CitA will host a summer drinks event for CitA members. In September there will be a Construction Information Technology Showcase. Alan told us about the upcoming November BIM Gathering previously and you can read about this in Issue 1 of Irish building magazine. The 2017 Gathering will be held on November 23rd and 24th at Croke Park. This article first appeared in Irish building magazine, you can subscribe by clicking this link. Irish building magazine and BIMIreland.ie will keep you updated on CitA events and news on the BIM Gathering throughout 2017.